For our June meeting, we were very fortunate and pleased to have Bill McLean of McLeans Smarter Home Entertainment present to us. We last had Bill in for our May 2012 club meeting – that time he brought us the wonderful Magnepan 3.7 speakers. This time he brought us the equally magical DeVore Fidelity O/96 speakers. DeVore Fidelity 0/96 loudspeakers (refer to http://www.mcleans.info/shop/productDetails.do?productId=225177). These DeVore speakers have been getting excellent reviews around the world. The O/96 model is also known as the Orang-utan. They have 96 db sensitivity and more importantly, 10 ohms nominal and 8.75 ohms minimum impedance, so they were easy to drive. Refer to the review on Stereophile at http://www.stereophile.com/content/devore-fidelity-orangutan-o96-loudspeaker. To quote Art Dudley from this Stereophile review (Dec 2012), “My own view is simpler: The O/96 is neither a budget version nor a luxury version of anything else. 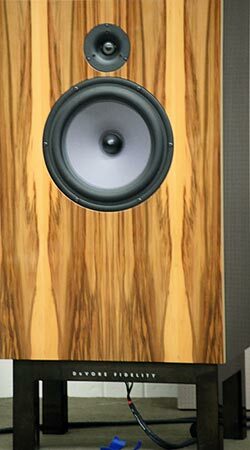 It's an extremely well-crafted loudspeaker that achieves a combination of strengths that is, as far as I know, unique. The O/96 is distinctly easy to drive with low-power amplifiers, yet it's clearer, wider of bandwidth, and more spatially accomplished than most other high-sensitivity loudspeakers. Colorful yet uncolored, the DeVore Orangutan O/96 is the loudspeaker many of us have been waiting for. Yes, an old Western Electric horn or even an Altec Valencia has more punch and drama, and Quad ESL has even more clarity and nuance of texture and timbre. But the O/96 gives a lot of everything and sacrifices little of anything. I'm thoroughly, giddily impressed.” Art Dudley is usually less effusive than that, so obviously these speakers were good! LM Audio LM-219IA Integrated Amplifier (refer to http://www.mcleans.info/shop/productDetails.do?productId=237651). 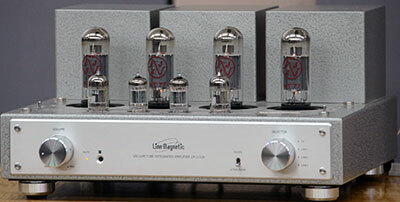 This “Line Magnetic Audio” Integrated Amplifier is a 24 watt Single Ended Class A amp with 300B driver tubes and 310A input tubes. It had adjustable bias via built in meters. Negative feedback was adjustable and defeatable. Power output was displayed via meters. It had two power transformers for dual mono operation, and point to point wiring throughout. LM Audio is based in Zhuhai, Guangdong province, China. PS Audio Direct Stream DAC (refer to http://www.psaudio.com/products/directstream-dac/). This DAC offers a pure 100% single bit DSD based D to A Converter with a passive output stage and resolution perfect volume and balance controls. It has a simple, direct signal path with only one master clock and offers excellent immunity to jitter from sources. Modified Oppo BDP-95 player (refer to http://www.customanalogue.com/jlti_multiplayer.htm). For the front-end Bill also brought a BDP-95 player modified by Joe Rasmussen to Level 3 standard. We also had a monitor on hand to allow us to play music from flash drives via the Oppo's USB input in our BYO session. Auditorium 23 cabling (refer to http://www.mcleans.info/shop/productDetails.do?productId=225406 and http://www.mcleans.info/shop/productDetails.do?productId=225407). These are musically, harmonically and texturally rich cables, not to mention affordable! The links above will take you to information on their speaker cables and interconnects, respectively. After the initial introductions, Bill spoke about each piece of gear in turn, complete with pricing. After about a 20 minute presentation, Bill played us some tracks from his Mac. Along the way he introduced Joe Rasmussen, the fellow that had modified the Oppo BDP-95. Bill had brought in a large integrated amplifier that he really wanted us to hear. But unfortunately it didn’t want to behave on the day. We suspect that the two 300B tubes had inadvertently been inserted the wrong way around, which caused a fuse to blow inside for that part of the circuitry. The tubes did have different sized connectors so normally you wouldn’t expect this to be possible. However, these tubes had only slightly smaller pins on two of the four connectors, which meant that you could actually insert the tubes the wrong way. Fortunately Bill had the foresight to bring a second backup amplifier. The backup amp was slightly more powerful, but not as sweet or resolving sounding. The speakers were undoubtedly the star of the show. They retail for $14000 a pair. They had a beautiful mahogany coloured face and dark sides. The finish was immaculate. They sat on custom made stands that elevated the tweeter to ear level. The shape of the speakers was somewhat reminiscent of older Harbeths. They did appear a bit old-school in their shape (in a gorgeous way! ), but they were anything but old-school in their sound. They had a thoroughly modern sound – clear, quite transparent with a lovely balance. They had beautiful tonality and smoothness across the frequencies although they had a tendency to sound a bit loose in the bass at times, depending on the bass weight in the material played. They also sounded a bit bright at times, again depending on the music. I have read reviews of these speakers – brightness was something that was not mentioned or hinted at. I suspect that the backup low powered amplifier had inadequate power to properly drive the speakers to a satisfactory listening level without bordering on clipping and hardness. Nevertheless, one person went so far as to declare the system the best sounding they’d heard at the club. Others commented that they thought the system sounded better in the second half. That could well be due to the system thoroughly warming up. Leigh Fercher was our presenter in our member’s music segment this month. Leigh is obviously into adventurous and intricate jazz – it was not for the faint hearted! That said, hardy clapping at his finale suggested that it was appreciated nonetheless. I’d like to pass on our thanks to Bill McLean for presenting on the day. Not only did he bring an excellent system, but he also brought the rack that the electronics sat on! And he gave up his Sunday once again for our club. Thanks Bill!